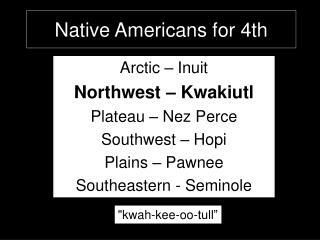 Kwakiutl Native Americans. By:Jackson Estes. Region. 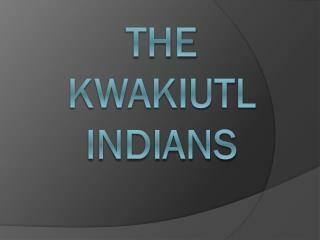 The Kwakiutl Indians are original people of the Pacific Northwest Coast. 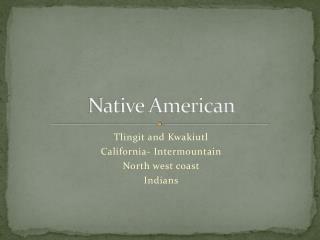 They live in British Columbia, Canada. Foods. 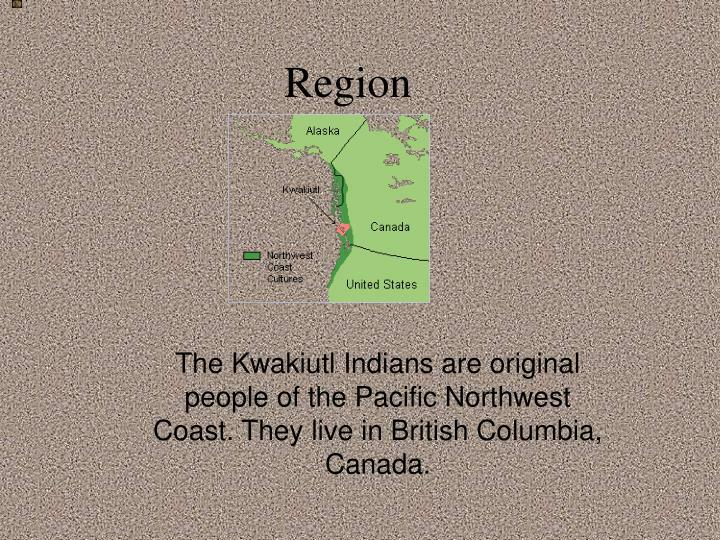 The Kwakiutl Indians are original people of the Pacific Northwest Coast. 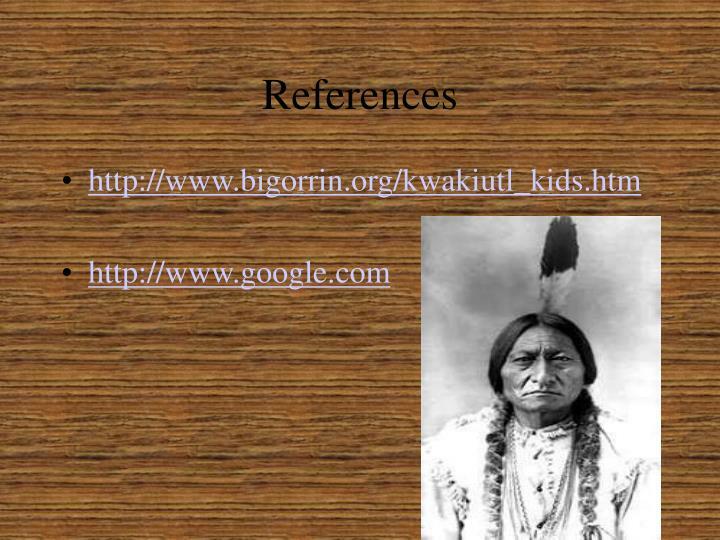 They live in British Columbia, Canada. 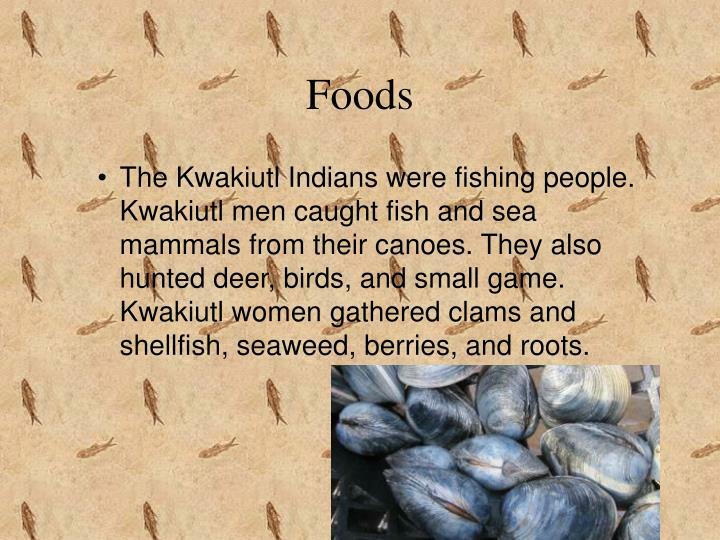 The Kwakiutl Indians were fishing people. Kwakiutl men caught fish and sea mammals from their canoes. They also hunted deer, birds, and small game. 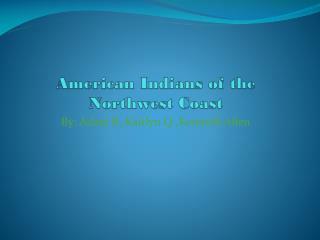 Kwakiutl women gathered clams and shellfish, seaweed, berries, and roots. 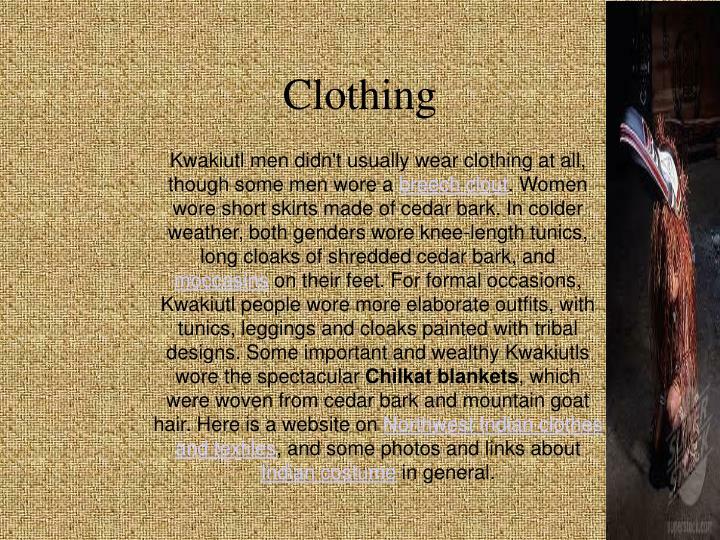 Kwakiutl men didn't usually wear clothing at all, though some men wore a breech clout. 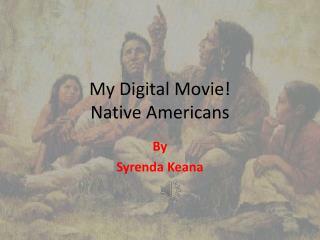 Women wore short skirts made of cedar bark. 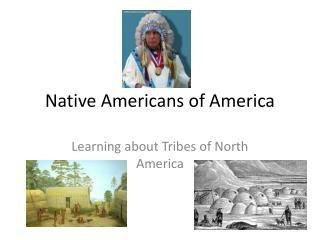 In colder weather, both genders wore knee-length tunics, long cloaks of shredded cedar bark, and moccasins on their feet. For formal occasions, Kwakiutl people wore more elaborate outfits, with tunics, leggings and cloaks painted with tribal designs. Some important and wealthy Kwakiutls wore the spectacular Chilkat blankets, which were woven from cedar bark and mountain goat hair. 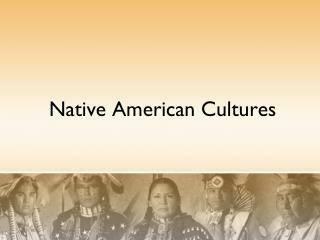 Here is a website on Northwest Indian clothes and textiles, and some photos and links about Indian costume in general. 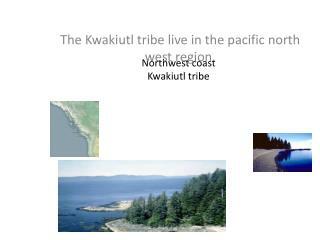 The Kwakiutls lived in coastal villages of rectangular cedar-plank houses with bark roofs. Usually these houses were large (up to 100 feet long) and each one housed several familes from the same clan (as many as 50 people.) 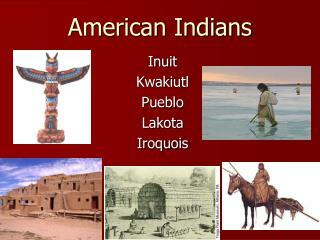 Here are some pictures of American Indian houses like the ones Kwakiutl Indians used. Today, old-fashioned buildings like these are still made from cedar wood, but they are only used for ceremonial purposes. 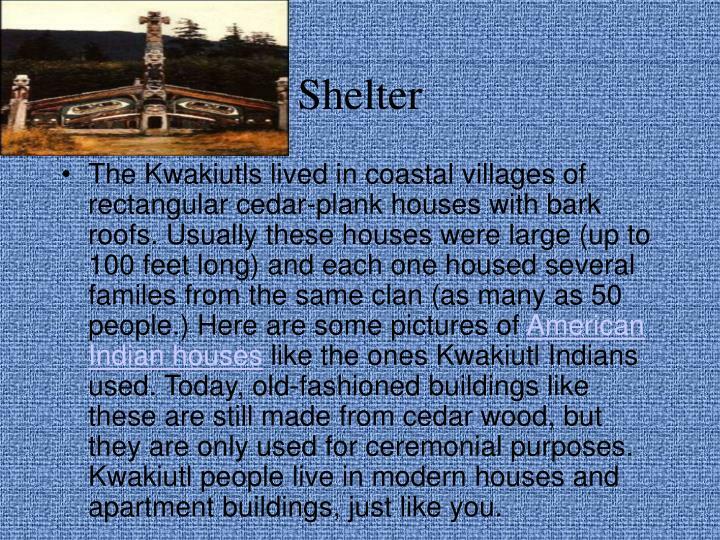 Kwakiutl people live in modern houses and apartment buildings, just like you. 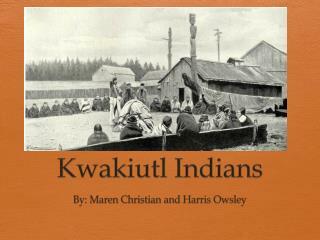 Kwakiutl fishermen used harpoons, nets, and wooden fish traps. Hunters used bows and arrows. 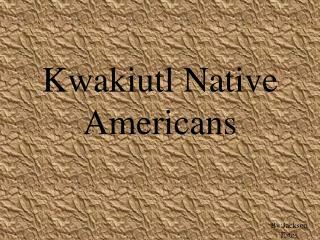 In war, Kwakiutl men fired their bows or fought with spears and war clubs. Some Kwakiutl warriors wore bulky armor made of wooden rods lashed together to protect themselves from enemy archers. 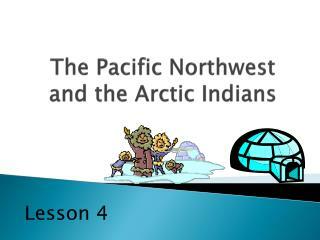 There are lots of traditional Kwakiutl legends and fairy tales. 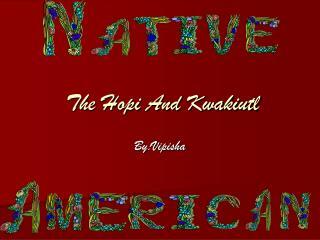 Storytelling is very important to the Kwakiutl Indian culture. 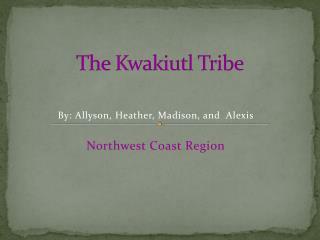 Here is one Kwakiutl legend about the origin of totem poles. Religions are too complicated and culturally sensitive to describe appropriately in only a few simple sentences, and we strongly want to avoid misleading anybody. 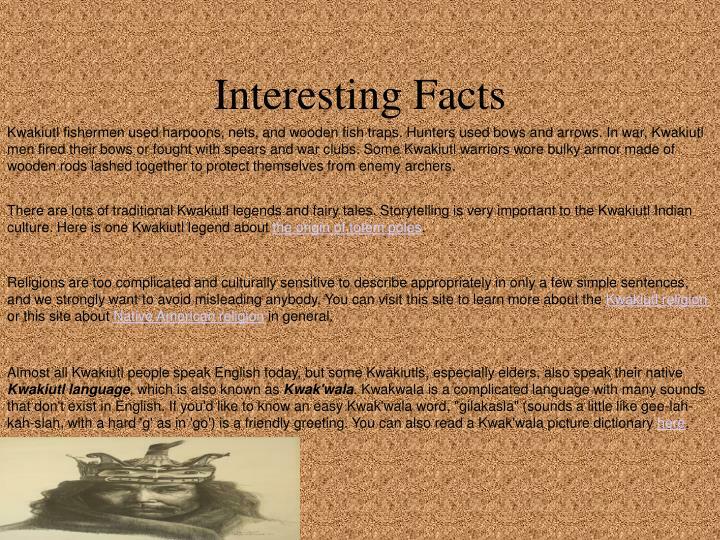 You can visit this site to learn more about the Kwakiutl religion or this site about Native American religion in general. 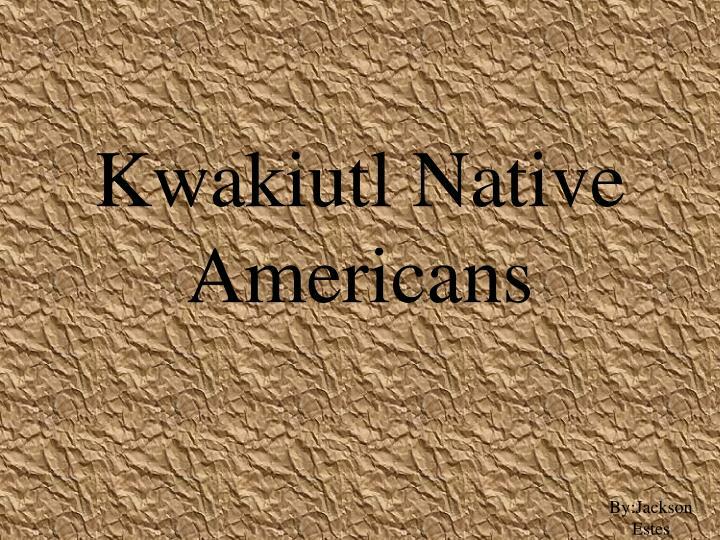 Almost all Kwakiutl people speak English today, but some Kwakiutls, especially elders, also speak their native Kwakiutl language, which is also known as Kwak'wala. 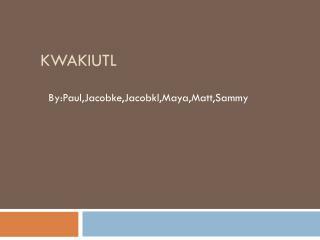 Kwakwala is a complicated language with many sounds that don't exist in English. If you'd like to know an easy Kwak'wala word, "gilakasla" (sounds a little like gee-lah-kah-slah, with a hard 'g' as in 'go') is a friendly greeting. You can also read a Kwak'wala picture dictionary here. 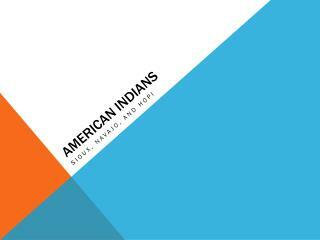 Native Americans for 4th -. 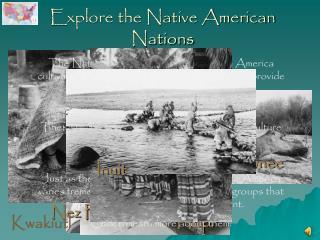 arctic – inuit northwest – kwakiutl plateau – nez perce southwest – hopi plains – pawnee southeastern - seminole. &quot;kwah-kee-oo-tull”. 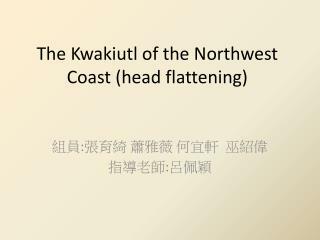 northwest - kwakiutl. 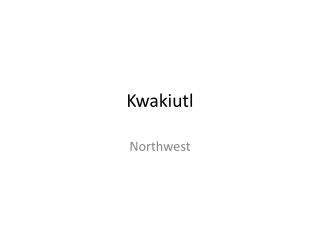 northwest - kwakiutl. 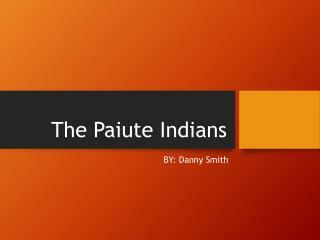 The Paiute Indians -. by: danny smith. their culture. paiutes, culture linked to grand canyon traditional lands extended north &amp; west of the colorado river a.d. 1300 until their removal to reservations in 1800s. the colorado river.